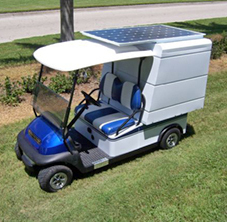 Cruise Car management is reporting that some of their All American solar powered LSV customers are able to operate their vehicles completely off the grid. Customers are driving up to ten miles per day on just solar power alone and some have not had to use an external power source since purchasing their vehicles. These reports provide more evidence that the STOV market continues to be sliced up into many sub-segments which are being satisfied by vehicles with a particular set of features and functionality. In this case the question is how large is the potential market for vehicles that can exclusively or predominately operate on solar power. In the future we can anticipate an attempt to increase the solar power generated by these vehicles through larger solar panels, new photovoltaic technology and innovative placement of photovoltaic material on vehicles. As the range improves this sub-segment can grow incrementally. Among 4,433 entries from approximately 1,700 companies from 60 countries, The Garia has been awarded with an ’Honourable Mention’ in the Red Dot Design Award 2011. The jury of highly respected experts grants this recognition to products with especially refined detail solutions. “As always, our jury cast a very careful eye over the products submitted. Design quality has asserted itself clearly in the judging process, with genuine and new creative solutions also being rewarded. Both of these criteria are not just yardsticks for good design, but also for the potential for success on the market. This potential is increased several times over by the targeted use of our renowned design award”, says Professor Dr. Peter Zec, the initiator of the Red Dot Design Award. Designed and developed in Denmark, The Garia is a complete reinvention of the traditional golf cart. It is developed according to the user’s needs with a wide range of user-friendly features such as an extra large cabin with a comfortable and car-like driving position, an innovative easy-access golf bag holder, a new type of director selector and a digital cluster. Other features for improved convenience and usability include a built-in refrigerator, storage options integrated in the design and an onboard charger. “We set out to build the world’s best golf car and based many of the design improvements on in-depth usability research, and with this prestigious recognition I truly believe that we have succeeded in our efforts”, says Mr. Anders Lynge, designer of The Garia. Along with hundreds of other prize-winning product designs, The Garia will be on display from 5 July to 1 August 2011 in the exhibition “Design on stage – winners red dot award: product design 2011” in the red dot design museum at the world heritage site of the Zeche Zollverein Coal Mine Industrial Complex in Essen. With in excess of 1,500 products spread over an area of more than 4,000 m2, the Red Dot Design Museum houses the largest permanent exhibition of contemporary design worldwide. Farm Industry News recently published a generally favorable review of the new John Deere Gator 825i. Not surprisingly, the review is based on the vehicle’s performance in an agriculture setting. What I like about the review is that it evaluates the vehicle based on application specific performance e.g. straddling 30 in. corn rows. The author suggested the vehicle would be a good alternative to a used pickup truck. Here is a quick summary of the review. ..named one of Industry Week magazine’s top 10 plants in North America in 2009, and also received the Shingo Prize for Operational Excellence, often called “the Nobel Prize of manufacturing,” that same year. The facility is ISO 9001 and ISO 14001 certified, meaning that it has world-class procedures for manufacturing and environmental protection. GGT’s future partners will search for improvements in the electric vehicle drive train space in the areas of low voltage motors, controllers, batteries and battery management systems.